The Gropius House was the family residence of noted architect Walter Gropius at 68 Baker Bridge Road, Lincoln, Massachusetts. It is now owned by Historic New England, a conservation trust, and is open to the public Wednesday through Sunday (June 1 – October 15) and weekends (October 16 – May 31). An admission fee is charged. The house caused a sensation when built, it is a hybrid of the traditional New England aesthetic and the modernist teachings of the Bauhaus. In keeping with Bauhaus philosophy, every aspect of the house and its surrounding landscape was planned for maximum efficiency and simplicity. Gropius carefully sited the house to complement its New England habitat on a rise within an orchard of 90 apple trees. The site for the house is set adjacent to the main road that cuts through the town. It is set amid fields, forests, and farmhouses, the Gropius House mixes up the traditional materials of New England architecture (wood, brick, and fieldstone) with industrial materials such as glass block, acoustic plaster, and chrome banisters. The house structure consists of a traditional New England post and beam wooden frame, sheathed with white painted tongue and grove vertical siding. Traditional clapboards are used in the interior foyer, but are applied vertically. Striking as it is, the house was built with economy in mind. In regards to the interior of the house, Gropius did not take the New England architectural vernacular into consideration, rather the interior is a mix of fabricated pieces from the Bauhaus and furniture by Marcel Breuer. Similar to the work that was happening simultaneously in Europe; the house employs an open spatial organization that filters light throughout through the large windows. Similar to the exterior of the house, Gropius uses a minimalist color palette throughout the interior consisting of black, white, pale greys, and earth tones with only faint splashes of red. All family possessions are still in place, including the collection of furniture designed by Marcel Breuer and made in the Bauhaus workshops. 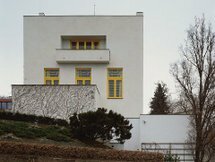 In 2000, the house became a National Landmark, which is a testament to the influence of Walter Gropius’ life work.